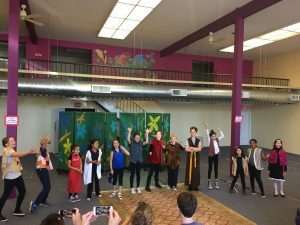 Trevor Hoffmann: On September 21, I met with Alaz Ozbirinci, a recent student of Marin Shakespeare’s 2018 Summer Camps. Alaz, age 8, arrived with her parents, Purnur and Murat. After introductions, we sat down in Marin Shakespeare’s spacious classroom (and future indoor theatre) at 514 Fourth Street. As Mom and Dad chose seats nearby, Alaz and I sat down at a table to have a chat about theatre camps and a summer spent with Shakespeare. Trevor Hoffmann: Hi, Alaz. Thank you for meeting me. Alaz Ozbirinci: Thanks for inviting me. TH: Let’s get right to it: What Shakespeare camps did you do this summer? AO: Tennis-Drama, Hamlet, and As You Like It. TH: Who were your teachers? AO: Braedyn and Nicole, then Wally and Isabelle, and then Nicole again. Note from Trevor — All of these teachers are actors who have performed in recent Marin Shakespeare Company productions. TH: How was it working with the other actors? AO: For the first camp I did Tennis/Drama, and it was only boys except for me, and I was the youngest one. But, there were less than ten of us in all the camps, so we always got attention. Tennis/Drama was the “scenes and monologues” camp, so I got lots of help because I had the longest monologue. TH: Now, you did “All the world’s a stage” for your monologue for the first camp? Had you memorized or worked on that monologue before? AO: No. This was my first monologue. I have read some Shakespeare in my books – I have shortened-down versions at home. But I’m reading Harry Potter too, and Shakespeare is not too much harder. TH: Oooh, may we go off-topic for a second? I’m a huge Harry Potter fan! What book are you on? AO: I’m on Order of the Phoenix, but this summer I didn’t read any of it because I was so focused on Shakespeare! TH: Wait, are you telling me that Shakespeare was worth pausing Harry Potter for a summer? Here, Alaz smiles and nods matter-of-factly – for her, this is an obvious truth. TH: And back to Shakespeare: how did you memorize your lines for all the parts you played? AO: I practiced almost every night with my parents, or my cousin when she was around. TH: What was it like to put on a full production with your fellow actors in Hamlet? AO: Well, Hamlet had the opposite group from Tennis/Drama Camp: it was all girls and one boy. And, it was different because in Hamlet a lot of people die – really everybody dies. So, we learned how to die on the wooden stage. It wasn’t soft or anything, so our teacher, Isabelle, told us not land on our knees, and showed us how to fall safely. We had to practice it a lot. There was also a fight in Ophelia’s grave, so Isabelle taught us “kitten paws”. TH: “Kitten paws”? I’ve never heard that; what does that mean? AO: Kitten paws is for safety; it means you keep all five fingers together when you’re grabbing someone’s shoulders, so you don’t pinch them or hurt them with your thumbs. She demonstrates, holding up hands and miming grasping a person’s shoulders. TH: Did you have any big challenges or tough moments to overcome, this summer? 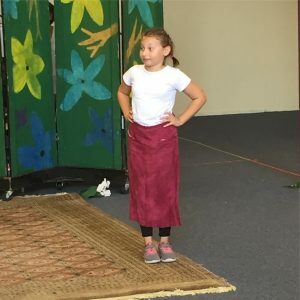 AO: Well, in the As you Like It camp, I got poked in the eye during a quick-change between my characters, and I had to go back on right away. My eye was watering really badly, but – “the show must go on!”. I just kept blinking through my lines until I could go off stage. TH: Wow. That’s dedication! Of the roles you played this summer, what was your favorite? AO: It might have been Hamlet – I was in an arm cast right until the performances, but I was healing fast and I took the cast off early because I didn’t want to have it on for the performances. TH: Have you ever performed in front of your parents? AO: I don’t think so, no. This was the first time! TH: How did it feel before a show? AO: (Laughing) I would get really nervous. 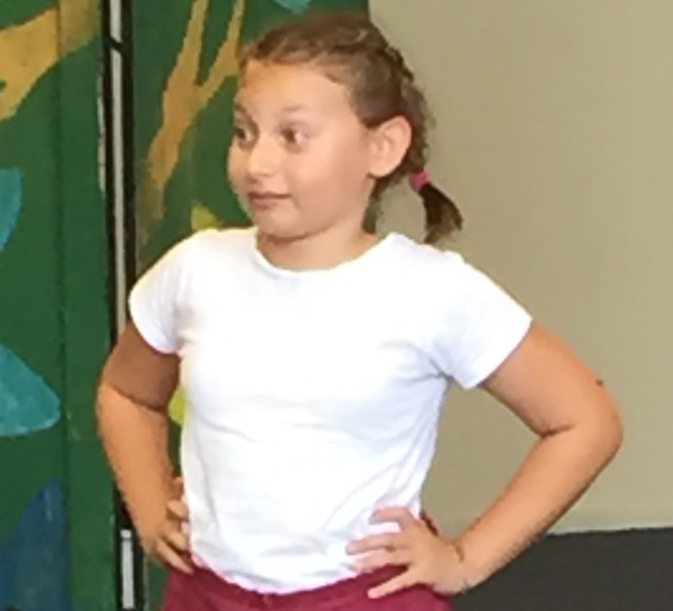 But, on the Tennis-Drama camp performance day, it was also so hot that I was distracted from being nervous. 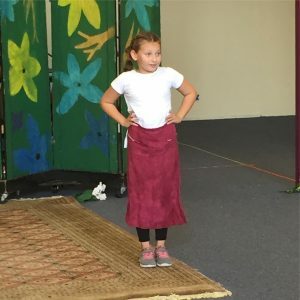 We got to perform on the big outdoor stage were the main plays happen. Braedyn and Isabelle brought us ice-cubes to hold on ourselves backstage to keep cool! But, I’d had a cast on my arm for a lot of the rehearsal time, so my arm was already used to being that sweaty. Alaz chuckles at this; the memory must be far more amusing than unpleasant. TH: How did you feel after performing in your shows? AO: Good. It was fun. We always had after-parties where we got to hang out with our parents, and my mom could bring my friends to see me and come to the party too. TH: How do you feel about Shakespeare now, after doing three camps with Marin Shakespeare? AO: I want to do Shakespeare until I can’t go to this camp anymore. But since I’m eight, and the camp goes to twelve, I still have four more summers! TH: Do you think you will use what you learned this summer in your future? AO: Yes. I want to be a teacher when I grow up, and this would help me with talking to students. And if I become a teacher for the Marin Shakespeare Camps, then I’ll use it a lot! TH: Well, I hope to see that one day! Alaz, thanks so much for meeting with me – we really appreciate your time! AO: Thank you for the interview!